Continuing on toward Glacier: On Friday July 20 we left Billings and headed for Bozeman - what a difference. Unlike Billings, Bozeman "feels" like a western town. The Bridger range and Spanish Peaks surround Bozeman making for breathtaking views in all directions. As we explored some of the neighborhoods and outlying areas it became clear that Bozeman has some very upscale residents. In many ways it reminded me of Boulder, CO and Bend, OR. 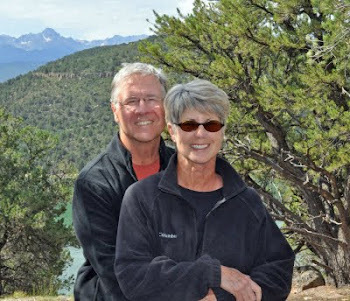 To our friends Jeff and Lauran Yates who are moving to Bozeman as I write this blog - nice choice! We will look forward to visiting you. Perhaps the biggest surprise while in Bozeman was our trip to the Museum of Modern Human Progress (formally, the American Computer Museum). The name change reflects the fact that the museum is more than just the history of computers. Yet this is a small but comprehensive museum remains true to it's mission, "To collect, preserve, interpret, and display the artifacts and history of the information age." 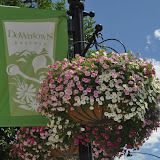 We spent the rest of the afternoon in downtown Bozeman eating and hunting for interesting beads. On Saturday, we pointed Tiger lll (our RV) north toward Flathead Lake. Trying to find a campsite on Saturday during the height of the tourist season is never a good idea. Sometimes luck is on your side. We had resigned ourselves to a night at the Polson Walmart. However, as we entered the very small town of Ronan we saw a sign for the Diamond S RV Park. Indeed it was a diamond. This is a wonderful little RV park about 9 miles south of Polson and the south shore of the magnificent Flathead Lake. Check out this view of the Mission Mountains from our campsite. On Sunday morning, we headed to Polson and the annual Cherry Festival. Yes, Mt. Rainier Cherry's are really good but not any better than fresh Flathead Cherry's - we bought lots, ate a buch and froze the rest. Yum. The afternoon was spent traveling along the west shore of the lake and visiting the charming little town of Bigfork. They have a great little cooking store and of course we had to stop for some ice cream. Monday on the suggestion of Diamond S RV Park camp manager we headed out to the Miracle of America Museum. OMG this is to paraphrase Steve Martin, a "Wild and Crazy" place. But what fun... In some ways it is a glorified junkyard. But it is also a history of the gadgets and mechanical inventions of America. What we had anticipated as a short visit turned into several hours of wandering through the many buildings filled with an amazing array of stuff. The Ninepipes Museum is named after Chief Joseph Ninepipes, a Bitterroot Salish Chief. JoAnne and I were amazed at the wealth of early photos, artifacts and antiques contained in the museum that spanned over a century of life in the Flathead Reservation. The St. Ignatius Mission is a Roman Catholic mission founded in 1854. It is really a pretty little church. On Tuesday, July 24 we pulled out of the Diamond S and headed to Glacier to start our volunteer camp hosting. Stay Tuned. Click here for all of the photos. Yes, We Are in Glacier – But First!